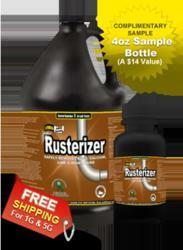 Rusterizer revealed its non-toxic rust removal product. After renewing its license, the company made available to the public its cost-cutting rust removal spray. It eliminates the need to repeat the rust treatment and it can do the work of a number of employees. To save any rust-damaged item from total ruin, rust removal is a requirement. But though there are numerous rust removers that can help complete the process, the problem is that not all of them can deliver an effective treatment. Many of them, instead of cutting down home expenses, they bring in more financial problems. Wanting to help property owners fight rust without costing them too much, Rusterizer.com has recently developed a truly beneficial product. Rust, more than any other material, is associated with metal. Where there is metal, surely, there is rust. However, apart from iron metals, rust can actually damage almost any material. No thanks to its stain, it can damage almost any item. To clear rust, there are professional rust removal services available. The downside is that they are expensive. For a cheaper option, one can go for rust sprays. However, to make sure that the product will solve and not worsen the problem, it must be both effective and safe. Rusterizer's solution is exactly that – effective and safe. Made from unique natural ingredients, the spray contains no harsh chemicals and can treat rust and rust stains on almost any item or material. And so, it poses no risk to health. Apart from that, it releases no pollutants making it an environment-friendly product. As a bonus, the solution, also called as Rusterizer, is affordable. It is the best rust spray that consumers can get at a very low cost, a representative of the company said. Apart from being low-priced, the non-toxic rust product is also financially beneficial in a way that it can reduce labor cost. That equates to bigger profit for those who are in a rust removal business for two reasons. It eliminates the need to repeat the rust treatment and it can do the work of a number of employees. Home owners can also receive the same health, environmental and financial benefits from the product. Though initially available only to large companies, the solution is now made accessible to the public after the renewal of Rusterizer's license. Hence, anybody can now implement a rust removal process without spending too much or putting someone's health at risk. To prove that the product is indeed beneficial, the online company released a video of Rusterizer in action. Additionally, it is giving out samples of the non-toxic solution.